It’s a very sad fact that according to the U.S. Department of Labor, nearly 2 million Americans each year state that they have been a victim of some kind of workplace violence. Any act of physical violence, intimidation, harassment or other aggressive behaviors can fall into this category. Thankfully for a great majority of American workplaces, there are effective ways to identify risk factors for workplace violence and proven strategies to greatly decrease the chance of an incident happening. Our team of highly trained, experienced professionals can partner with you to proactively address this growing problem and find proven ways to increase awareness and education to minimize risk. The dedicated professionals at P4 Security Solutions utilize many decades of professional police and military experience to create custom designed, tailor fit, workplace violence training programs for executive management and company supervisors. Our training focuses on education about general societal workplace violence, how to recognize the warning signs of potentially dangerous individuals before they strike, prevention strategies and what specific procedures should be followed in order to minimize the impact on people should an occurrence happen. Clients have relied upon P4 Security Solutions to help protect their employees and corporate assets when the potential threat of a workplace violence incident has developed. We can quickly and effectively create a protection detail at an office location in such a manner that does not instill fear, concern or a feeling of instability among the workforce. In addition, if a certain individual (or group of people) are identified as being a risk for potentially creating a workplace violence incident, P4 Security Solutions can conduct professional and lawful surveillance on the people in question, to minimize the risk of an occurrence actually happening. We will also work closely with local law enforcement agencies during the process. Should our initial contact with an employer be made after a workplace violence occurrence has taken place, we are expertly equipped to create a custom tailored strategy to meet the protection needs of people and property. 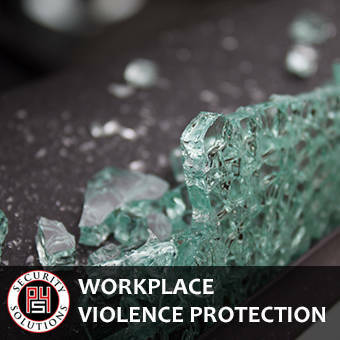 The experienced and dedicated professionals at P4 Security Solutions deeply believe that when it comes to avoiding the threat of workplace violence incidents, prevention, awareness and training is key to minimizing the risks associated with this growing societal menace.